Wonderful utility! It will be very supportive to the people who lost their files. 2 days before I lost some of my pictures from hard drive and I want to get them back. Will your software support me to recover my pictures? I heard about Remo Recover tool also and it is also a perfect tool to recover deleted data. Just tried it, v1.42. Copied an executable on a drive, deleted it (shift+delete), run Recuva, select *.exe as filter, scan took 10 seconds, found the file I just deleted, highlights it with a green icon (it found really old files as well, but highlighted them red as I'd expect), click on it, recover to my C drive, I'm told the file is recovered successfully, run the exe from the C drive and it works. So works as advertised, nice easy interface, quick scan, and reliable colouring of the recoverable files. I can't think of any reason to deduce any points, so it gets a 5. Pros: Nice UI. Pretty quick scan (except deep scan). I think it works like most other free recovery software. Cons: First of all, you can't alter and save filter presets. In case for example you're looking for document files but the document file type is not included in the preset, you have to append it in filter box. And then the filtering process can be TERRIBLY SLOW. Moreover, you can't save the list of files found in case you need to resume work later. You have to redo the scan again. Overall: OK if your hard drive isn't too big. This doesn't work at all, anymore. It shows NOTHING. I just delete some pics and took the card to a Vista 32 bit system, ran the deep scan and nothing shows up! Freaking junk! I used to love this program! I have never had much success with this. 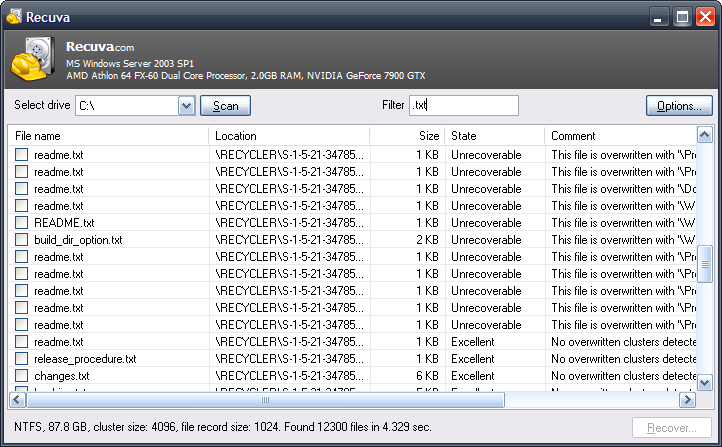 Seems to find the file but has issues restoring them. it does what it says ... and it's free! Never really needed it (r-studio never failed me when I did) but any time I have tried to recover files deleted moments before, it never found them. Practically worthless from my experience. I have been using this for a while, and it has never failed me. However, this version is not working to recover anything on a simple sd card. I don't know why. It worked great at the first go but when I looked at the file nothing was there. and has failed to recover my pictures for the flash disc. best of it's kind these guy create some great programs cc cleaner defraguller good stuff and free. Probably one of the best freeware undelete tools available. Very simple and easy to use for recovering deleted files. But for recovering lost files/partitions, I'd recommend TestDisk, and for damaged files/drive, I recommend GetDataBack. @Zoroaster: The slim version doesn't include the toolbar but still requires one to install the program, while the portable version doesn't require any installation.